It is wonderful to be back in the beautiful City of Hanoi. Vietnam has been a Party to CITES since 1994. It has taken many important measures to implement the Convention since that time. 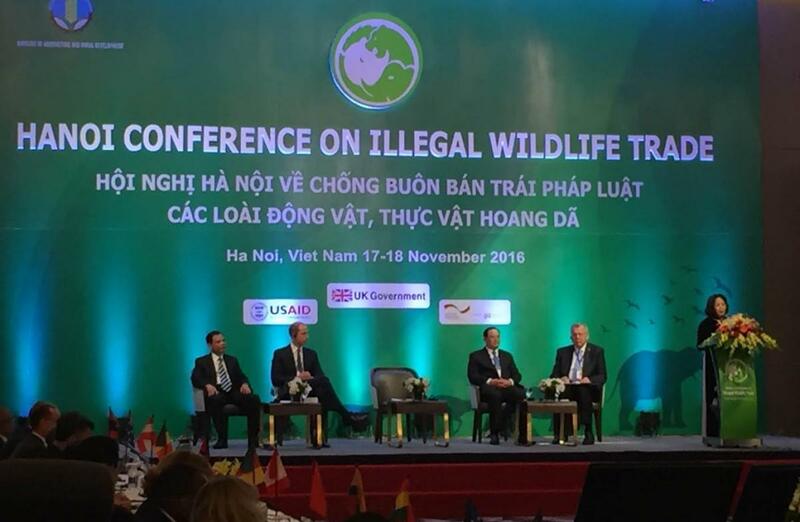 Over the past few years we have seen Vietnam demonstrate an increasing level of commitment to tackling illegal trade in wildlife, which is evident from this week’s conference and surrounding events. We express our sincere thanks to the Government and people of Vietnam for hosting this important event and for its very warm hospitality. Over the past five years or so, I feel like we have been on a journey together to end illegal trade in wildlife. Some have been with us right from the start and others have joined us along the way. And there is now a global collective effort underway to tackle illegal trade in wildlife and at the global level all of the necessary elements have fallen into place to effectively combat these highly destructive crimes. We are seeing unprecedented levels of high-level political support and international and regional cooperation – and in the context of this process we would like to acknowledge the efforts of the UK Government and the British Royal family in raising the political profile of this serious threat to wildlife. There are more financial resources available to tackle the issue than ever before, coming from a wide range of bilateral, multilateral and philanthropic sources. And there is vastly improved technical support available at the country level to advance targeted demand reduction strategies, alternative livelihoods and enhanced enforcement. Just looking to enforcement, we have the International Consortium on Combating Wildlife Crime, ICCWC, that is now fully operational and actively providing coordinated support at the country level to help authorities fight transnational organised criminal groups. This includes support to apply the same tools and techniques used to combat other serious crimes – be it the use of modern forensics, enhanced investigation techniques, or money laundering. Today, there is a vast array of powerful decisions on tackling illegal trade in wildlife, coming from the UN General Assembly, CITES, UN Crime Commission, UN Environment Assembly, the GEF, INTERPOL, the World Customs Organisation and regional bodies across the globe. In fact, we have more mandates on tackling illegal wildlife trade than we could ever imagined just five years back. These mandates are critical to direct, guide and enable States and organizations to take action. Rural community directly benefiting from the wildlife tourism venture. This is where the fight will be won or lost. Governments, rural communities, civil society, the private sector, public figures and the media all have a role to play in achieving our shared objective. Bold decisions were taken at CITES CoP16 in Bangkok and CoP17 in Johannesburg on tackling illegal trade in wildlife. At CoP17, held just last month, for the first time-dedicated decisions were taken to address corruption, cyber crime and well-targeted demand reduction strategies. We now need equally bold concrete actions to implement them. Distinguished delegates, all of the political, financial and technical support that has been generated over the past five years must continue to converge and translate into direct support to the frontline to implement these decisions. This must be our focus going forwards – we are making remarkable progress in many areas and if we persist with these collective efforts we will end the surge in illegal trade in wildlife experienced over recent years. Thank you Chair, thank you Vietnam, and thank you to everyone who is here today for showing their support for the survival of the world’s wildlife.